How complex is Sydney’s new MyZone PT fare system? Related to another post reviewing fare systems, here is a more detailed look at Sydney’s new MyZone fare system, that starts in April 2010. If you think Sydney is about to get simple integrated multi-modal fares, read on. 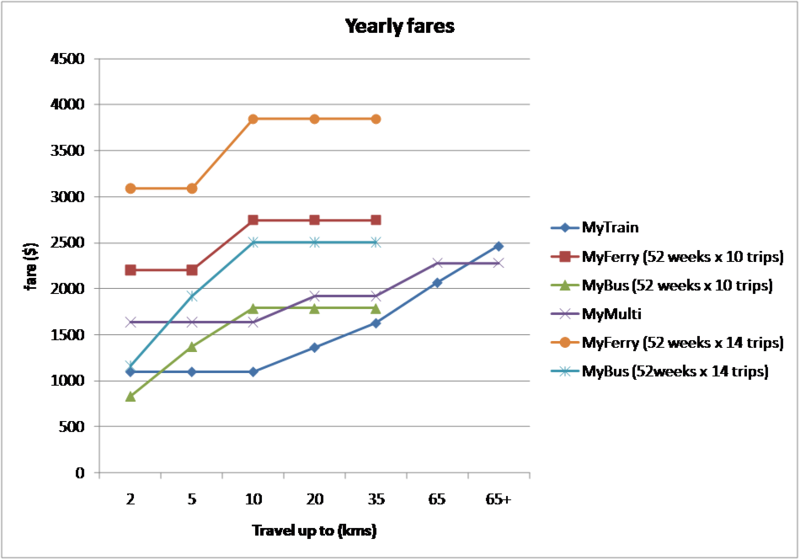 The following charts compare the costs of the different MyZone tickets for different travel distances (note: ferries kick up a fare level after 9km) assuming travel to and from central Sydney (it is yet another ball game if you are not travelling into the city centre). Ferries are clearly expensive. And there is a curious overlap between buses and trains. 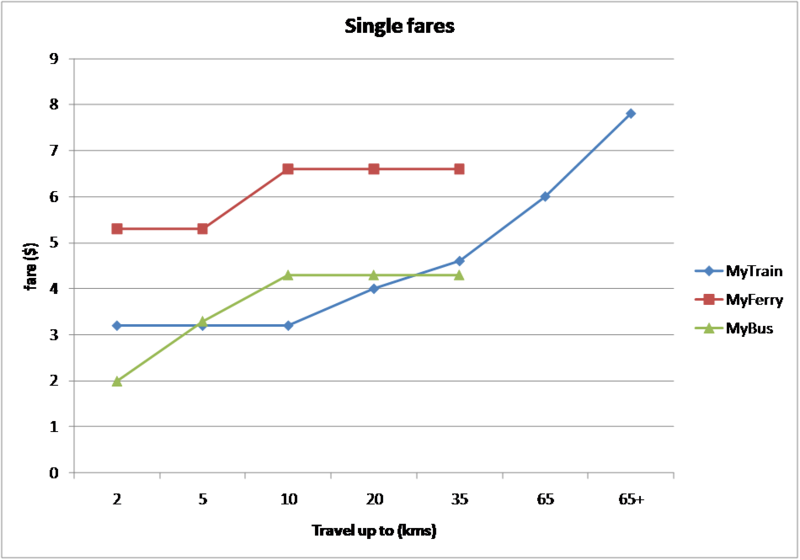 If you have a choice, then buses are cheaper for travel under 2kms and over 35kms (but no doubt slower). Unfortunately MyTrain and MyMulti have weeklies, while buses and ferries have TravelTens. The following chart shows buses and ferries with 10 and 14 trips, compared to MyTrain and MyMulti weeklies. 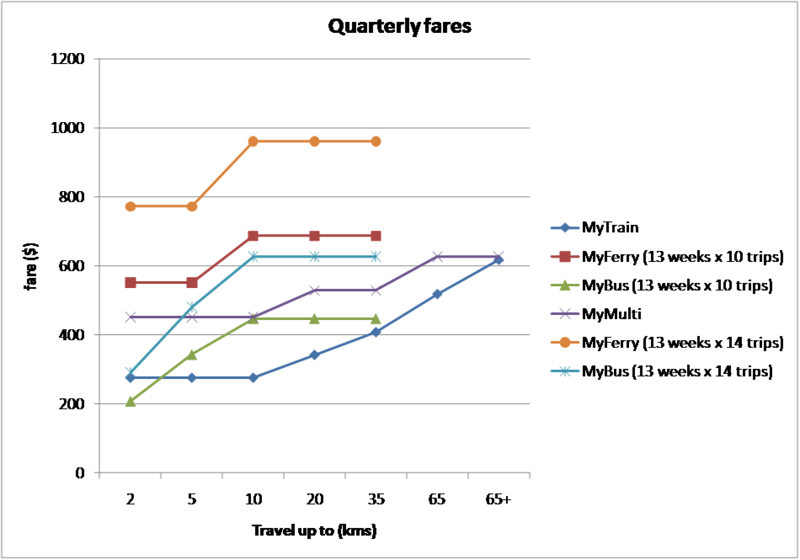 If you use buses 14 trips a week, then a MyMulti is better value, but only if you are travelling between 5 and 35kms. If you use buses 12 trips a week, then a MyMulti might be good value, but only if you travel 5-10km trips. And if you don’t know whether you will be making 10, 12 or 14 trips, then you have to make a guess and you might rip yourself off, or you might not. And don’t even think about MyFerry TravelTens if you are using ferries at least 5 days in a row. Trains are now cheaper than buses for everything over 2kms. So now if you use buses 14 trips a week, a MyMulti is worthwhile if you travel more than 2 kms. But if you travel 12 trips a week, then MyMulti is worthwhile between 5 and 10kms, but probably much the same as a MyMulti between 10 and 35kms. But if you travel more than 10kms and only use trains in MyMulti Zone 1, then MyMulti is better, even if you make 10 bus trips a week. It looks like the MyTrain yearly for over 65kms is actually a product no one should buy – you are better off with a MyMulti 3 yearly! If you can avoid buses, you’ll save money with a MyTrain ticket on most travel distances. But on the buses, the MyMulti is better value when travelling 11-14 trips per week for more than 2kms. For 5-10kms get yourself a MyMulti if you are travelling 10 times a week. But if you are going to average 11 trips a week, then a MyMulti yearly is borderline with MyBus for 10-35 kms. But they were all simple comparisons with fixed distances to and from the inner city. While MyMulti and MyFerry tickets are based on distance from the city, MyTrain and MyBus tickets are on distance between stations and stop. In fact a MyMulti 1 might be worthwhile if you frequently travel in the outer suburbs on buses, even if it is not valid for the trains in those outer suburbs. And there is plenty more complexity. you make 10 x 20km trips per week and 4 x 5km trips per week? you occasionally also take the train? in one direction only? for return trips? in the peak? in the off-peak? you use multiple modes but don’t travel into inner Sydney? you usually use the train but sometimes use the bus? only travel occasionally but like to make stopovers on the way? have a choice of two journey paths, one faster involving a transfer, and one slower but without a transfer? And is there one website where can you find out where sections points are on any bus route in Sydney? I trust it is not just my head that is spinning trying to think through this. So unfortunately it is still extremely difficult to work out what is likely to be best value for your travel in Sydney, because different modes have inconsistent fares, inconsistent fare bands, and inconsistent ticket products. And there are sometimes even unintended fare incentives to avoid certain modes or transfers even they mean a faster trip. I am a fan of consistent multi-modal fares because they avoid most of the complexity found in Sydney. See another post for what might be the best attributes of a fare system. In any other city in Australia, each of the above charts will have only one line that applies for all modes (and usually regardless of transfers). The only choice you might have to make is whether to go for periodicals (passes) or multi-trip tickets/a stored value smartcard. That choice depends on how many times you travel per week. In Melbourne, Brisbane and Canberra you need to compare the weekly cost of using multi-trip tickets at the frequency you travel to the cost of a weekly, and work out which is cheaper. Then if they are close, you might want to compare them with monthlies. And it essentially doesn’t matter what mode you use, or how many times you transfer to get from A to B. In Melbourne 10 trips on a 10×2 hour ticket is the same as a weekly, and 37 trips is the same as a monthly (about 8.5 trips per week). In Brisbane 12 trips on a go card is about the same as a weekly, and 47 go card trips cost about the same as a monthly (about 11 per week). 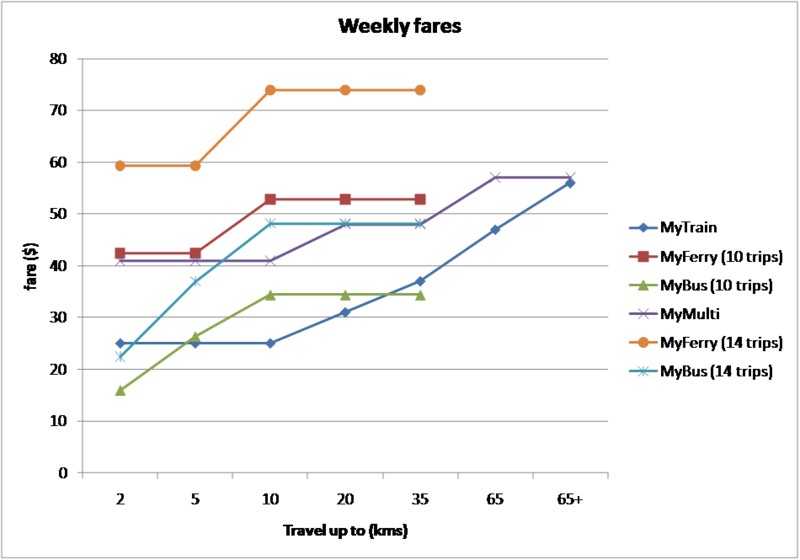 In Canberra a weekly is the same as 11 trips using Faresaver 10 tickets, and a monthly is 36 trips (about 8 per week). In Adelaide a multi-trip ticket is a no-brainer (there is no weekly or monthly). In Perth and Hobart you are always better off with a smartcard. But for Sydney you almost need to get a spreadsheet going to suss out the best fare product(s) for a particular trip from A to B. Or just go with something that works knowing you are probably paying too much. Or just drive a car. This entry was posted on Sunday, February 14th, 2010 at 12:37 am and is filed under Australian Cities, Pricing. You can follow any responses to this entry through the RSS 2.0 feed. You can leave a response, or trackback from your own site. One Response to How complex is Sydney’s new MyZone PT fare system?